Prominent in the Haftarah subjects of Succos is the War of Gog and Magog, the cataclysmic series of battles that will result in the final Redemption and the Messianic era. The Haftarah of the first day and that of the Sabbath of Chol HaMoed deal with this war. According to Rashi, this topic is related to Succos because of the prophecy that those nations who would survive the wars would join Israel every year in celebrating the Succos festival. 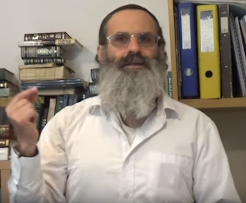 Nimukei Yosef to Megillah quotes a tradition from R’ Hai Gaon that the victory over Gog and Magog will take place in the month of Tishrei – the month of Succos. In the name גוג, Gog, one recognizes the word גג, roof, and thereby at once seees the contrast to succah, the weak, unstable covering of foliage. Actually, the whole history of mankind consists of this contrast. Just as people have the power to make [themselves] safe and secure against their earthly contemporaries by sturdy walls, so they delude themselves into thinking that they can make themselves safe and secure against that which comes from above – against God and…His power to direct matters. They think that they can find security in the protection of their own might, take their fate into their own hands, and crown the building of human greatness with gabled roofs, rendering them independent of God. [The war of Gog and Magog] is the battle of גג, roof, against סוכה, succah, the fight of the roof-illusion of human greatness which never allows rest, against the succah-truth of cheerful confidence and serenity which comes of placing one’s trust in God’s protection. R’ Hirsch’s exposition of the Gog-Magog relationship bases itself on the Hebrew grammatical rule that the prefix מ, mem, expresses the idea of projecting something. For example, אור is light; מאור, luminary, is a heavenly body which projects light. So, too, גג means roof – in R’ Hirsch’s view, it represents the philosophy that man can insulate himself against the heavenly power of God – מגוג is the attempt to project that philosophy on earth. The following words of the Ramchal will help to explain why it is davka Sukkot that the Christians have tried to grab hold of and make their own. But, whether they mean to bring us down to their level or raise themselves above their station, those same words will also explain what an impossible task they've set themselves. Sukkos observances in general are related to the Clouds of Glory. Besides the physical benefit of providing shelter and protection, these Clouds caused Israel to be set apart and elevated physically, they likewise were responsible for the transmission of the Essence of Illumination that made them unique. As a result, they were differentiated from all peoples and literally elevated and removed from the physical world itself. Israel thus became the highest of all the nations of the world. It was through these Clouds that Israel attained the high level that was meant for them. The result of this was then transmitted to every Jew for all generations. This is the Light of holiness, transmitted by God, which surrounds every righteous man of Israel, distinguishing him from all other individuals, and raising and elevating him above them all. This is the concept that is renewed every Sukkos through the sukkah itself. The Light of God also shines over Israel and engulfs them in such a manner that when they take the lulav and its associated species their enemies are terrified of them. Regarding this, the Torah says (Devarim 28:19), "All the nations of the earth shall see that God's Name is called upon you and they will fear you." This concept would have been openly attained immediately if it were not prevented by sin. Nevertheless, however, it still exists [potentially], and will be translated into action at the appropriate time. This concept is completed through the various observances associated with the lulav, such as when we shake it and march around [the synagogue] with it. God's Kingdom over Israel is strengthened, ultimately causing their enemies to fall and be subjugated before them, until they finally choose to be their slaves of their own accord. This is the significance of such prophecies as (Yeshayahu 49:23), "With their faces to the earth, they will bow down to you..." and (Ibid. 60:14), "The sons of those who persecuted you shall come to you bowing." All the nations will then be subjugated and bow down to Israel, and through the Jews they will partake of God's Light that shines upon Israel. All their pride will be brought low, they will be humbled under Israel, and through the Jews, they will return to God. This is the general significance of the lulav and its details. Yesterday's Christians usurped the Children's heritage via "replacement theology." Today's Christians have only just now agreed to move over and let the Jews sit beside them as an equal partner (conditional, of course, on a future acceptance of JC). The only way they will ever accept the truth that they have no claim on the Children's heritage at all is to give up Christianity altogether. ...The Talmud describes how, in the World to Come, G-d will challenge the gentiles to observe the commandment of Sukkah. Due to the intense heat, they will abandon the Sukkah, even kicking it on their way out. The Talmud notes that a Jew, too, is exempt from remaining in the Sukkah if he is uncomfortable, but he still does not treat the Sukkah demeaningly. Why is that difference so significant? The Rem”a (Orach Chaim 639:7) writes, ‘Anyone who is exempt from sitting in the sukkah will not be especially rewarded if he remains in it.’ Accordingly, the “scorching hot Sukkah challenge” tests one’s response to losing the opportunity of being rewarded for a mitzvah. Therein lies the difference between the Jew and the gentile. Once the heat renders sitting in the Sukkah a “non-profitable” endeavor, the gentiles will kick the Sukkah, considering it worthless. The Jew, however, does not see the Sukkah as worthless even when he stands to receive no reward for sitting in it. Rather, he sees the Sukkah primarily as a means to fulfill G-d’s will: to sit in it when G-d so desires, or not to, if G-d’s law should deem it unnecessary. The reward is only secondary, so its loss does not change the Sukkah’s value. Besides being "turned on" to prophecy by the Christians, the Jews involved with them are picking up other bad Christian habits - like taking verses out of context to use as "proof texts" for their version of the Torah. If adding to or taking from words of Torah are forbidden by HKB"H, how much more so the misrepresentation of God's words! This is the same dastardly deed that was carried out by the serpent in Gan Eden! Does the verse cited as "proof" of their contention speak about Sukkot? No! Devarim 31:12 – In context, it speaks of Hakhel, when every seven years, the king would read the Torah to all the people. Included among the Jews were the gerei toshav, the non-Jews who were living in Eretz Yisrael under very specific conditions. Even in the case of Hakhel, the "nations" were not "invited." There is no way, except through willful deception, to make this into an invitation for idolatrous nations to bring their avodah zarah into Eretz Yisrael and plop it down in the midst of our Sukkot celebration. And your stranger, i.e. a non-Jew who observes the Noahide laws. Although he is not bound by the commandments of the Torah, he should attend Hakhel and perhaps he will be inspired to convert (Ibn Ezra). Although the word גר, [ger], often refers to a convert to Judaism, Rabbi Yaakov Kamenetsky shows that in this case Rambam and probably Ramban agree with Ibn Ezra’s interpretation that non-Jews should participate in Hakhel. He comments that this is clearly not a commandment on the gentile, for if it were, there would be eight Noahide laws, not seven. Rather, it is a commandment on Jews to encourage resident gentiles [ger toshav] to attend (Emes l’Yaakov)…. Ok? So, what about their other example taken from King Solomon's prayer at the dedication of the Temple? And also to the stranger [nochri], who is not of Your people Israel, but will come from a distant land because of Your great name, Your strong hand, and Your outstretched arm, and they will come and pray toward this House. You shall hear from heaven, from Your dwelling place, and You shall do whatever the stranger calls upon You, that all peoples of the earth may know Your name, to fear You, as [do] Your people Israel, and that they may know that Your name is called upon this House, which I have built. [Rashi] and You shall do whatever the stranger calls upon You: Concerning an Israelite, I pray to give him according to his ways, but concerning a heathen, according to all the stranger calls upon You, because Israelites recognize the Holy One, blessed be He, and they know that He has the ability to do, and if his prayer is not heard, he assigns the cause to himself, to his sins, and he searches his deeds, but the heathen will complain of injustice and say, “I heard His fame throughout the world, and I toiled on many roads until I came and prayed in this place, and I did not find reality in Him any more than the other deities.” Therefore, You shall do whatever the stranger calls upon You. Again, this has nothing to do with Sukkot or any appointed Jewish holiday. It applies at any and all times that a gentile who is searching for the truth will come to the source of truth to investigate. Nochri is a term that describes a gentile who has not accepted the Sheva Mitzvot and may even worship false gods. This is as good a place as any to also point out that even righteous gentiles were not allowed into the actual Temple precincts which is probably why King Solomon specifically said "pray toward this house" - similar to how Jews pray towards the Temple Mount even now. It is a way of directing your prayer very specifically to the God of Israel [as opposed to any other god] since this is the place where He chose for His Presence to reside. "Archeologists have found markers around the boundary of the Temple grounds bearing this inscription: ‘Any foreigner [non-Jew] who ignores the warning and goes beyond this point shall have no one but himself to blame for the death which shall be his penalty.’"
I think when people hear the phrase "house of prayer for all nations" they form an image of Jews and non-Jews filing into a synagogue-or-church-like structure and sitting down side-by-side in earnest prayer. That's not what the phrase means at all. Surprisingly, the well-worn phrase "house of prayer for all nations" comes from the mouth of JC in the Greek Testament. The Hebrew original found in Yeshayahu 56 says amim and is more commonly translated in the Tanakh as "peoples." And the foreigners [bnei hanechar] who join with the Lord to serve Him and to love the name of the Lord, to be His servants, everyone who observes the Sabbath from profaning it and who holds fast to My covenant. I will bring them to My holy mount, and I will cause them to rejoice in My house of prayer, their burnt offerings and their sacrifices shall be acceptable upon My altar, for My house shall be called a house of prayer for all peoples [amim]. [Rashi] for all peoples: Not only for Israel, but also for the proselytes. So says the Lord God, Who gathers in the dispersed of Israel, I will yet gather others to him, together with his gathered ones. [Rashi] I will yet gather: of the heathens ([Mss. and K’li Paz:] of the nations) who will convert and join them. [On Isaiah 56:6-7] And those whose conversion to Judaism is with the sincere intent of serving God and not for any ulterior motives, attested to by their observance of the Sabbath and the covenant, shown by their "coming close to God" while the Jewish people are still downtrodden, those are the proselytes who God will bring to His Temple, His "House of prayer for all peoples," and grant them the joy of seeing their offerings accepted. But more than their material offerings are acceptable to God, the offerings and sacrifices of their hearts and spirits shall be desirable to Him. In short, under no circumstances can any words of Torah or the Prophets or Writings be used to prove the inclusion of those who engage in avodah zarah without willfully corrupting, twisting and misrepresenting their true meaning - a thoroughly dastardly deed!! The plan, God willing, is to continue the series on "The Three Wars..." at the conclusion of the holidays, but meanwhile, the Third War is ongoing and it is uniquely tied to Sukkot. Therefore, with God's help, we will deal with various aspects of what constitutes a major attack by the nations this week. No one who has ever witnessed the "Parade of Nations" taking place in the streets of Jerusalem during the Intermediate Days of Sukkot can fail to detect the aura and attitude of conquerors about the participants. They act like the city and the holiday belong to them, like they are the hosts and we the mere guests. It's not your imagination. There is a reason for that. 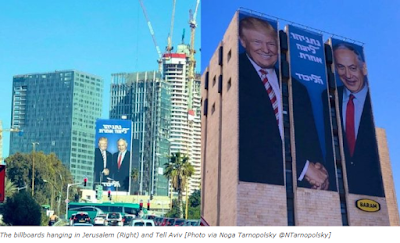 While the public reason for the parade is that it is to express love, solidarity and support for Israel, there are deeper reasons, more compelling reasons, truer reasons for why Christians flock to this city at this particular time. Zechariah foretold of a time when all nations will ascend to Jerusalem each year to "worship the King, the Lord of hosts, and to keep the Feast of Tabernacles” (14:16). Thus we also keep Sukkot now because of this future prophetic purpose. Throughout the Messianic Age, the entire world will celebrate this feast because it will mark the return of Jesus to the earth. But for now, Christians flocking to Jerusalem to celebrate the Feast of Tabernacles is a powerful statement of faith demonstrating that we believe the Millennial Kingdom of Jesus is coming. For the past 35 years, Christians from all over the world have come to Jerusalem each fall to celebrate the Feast of Tabernacles, sponsored by the International Christian Embassy Jerusalem. They come to take part in a dynamic worship experience and to taste of the joy of the Lord in the age to come. No truly Torah-observant Jew who is faithful to the covenant with HKB"H can condone, much less, enjoy, this horrible chillul Hashem!! It is an attack on everything that Torah-loving Jews hold dear in our holiest city at the time of our greatest joy. Note that it is not just the parade. This has turned into a week-long extravaganza of idolatrous worship and praise of a false deity and the expressed desire and invitation* that Am Yisrael join in. Speakers include Christians and Jews. Hashem yerachem aleynu! Real joy will come when our enemies are no more and we are at peace and without interference from the nations of the world - when they will have cast all idols and false worship aside. Just because they don't carry guns or knives and bombs are not exploding does not mean this is not a war, People! It's war by other means!! That's what makes it all the more dangerous to Klal Yisrael who are putting up NO defense!!! The Three Wars of Gog uMagog and "The UNholy Trinity"
There are so many aspects to this story, it is extremely difficult to know where to begin and how to follow the connecting path without going off on rabbit trails, which are themselves also important to investigate. But, it starts getting bogged down. Until now, I've been trying to build a case before presenting it, but that's not really the right way to go about it. In a court of law, the attorney tells the jury what he hopes to prove and then he presents his evidence, so then the trail of evidence can be followed logically. Let's see if I can sum up and start again. In Part 3, we looked at the history of Christian Zionism and its obsession with "fulfilling prophecy." I should point out here that Zionism has become the vehicle for the spread of Judeo-Christianity. 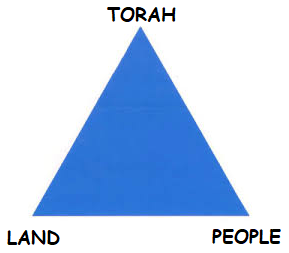 It has become the main point of commonality, of connection between Jews and Gentiles. I should also say that even though each time period has a different main focus, that does not mean that there are not vestiges of all three in operation at any given time. For example, we see that even though the Torah is to be the main focus of the Third War of Gog uMagog, Jews are still being attacked and killed and there are still discussions and plans to separate us from our land. With God's help, we'll explore the Third War more fully in coming days. Particularly, I hope to show how the two concepts of "Being a Light to the Nations" and the Temple being "A House of Prayer for All Nations" have been corrupted by Judeo-Christianity and is now being used as a weapon in this War Against the Torah. With God's help I will "present the evidence." The Jew’s safety raft is supported by three points. The top point is the Holy One, may He be blessed, with whom we are joined by faith and properly observing the Shabbat. The second point is the holy Torah, by means of which we are connected to Hashem through loving and studying it. The third point is the People of Israel who act in accordance with Jewish law and unite to sanctify the Heavenly Name by separating themselves from the airev rav and the gentile culture. ...I have a tradition passed down from one to another in the name of Maran HaGaon Rabbi Yehoshua Leib Diskin, z”l, that in the final war before the arrival of Mashiach all of the righteous Jews will be saved. Who are ‘righteous Jews’? Those who are separated from the non-Jews! I hope to present evidence to you that this separation is the very key to our final redemption and that all who promote the unification of Jews and Gentiles, in whatever form, no matter how well-meaning their intentions, are actually holding redemption back!! We see also among the Christians who are coming to connect with Jews, that they do so through the State, the Settlers, the IDF, and organizations promoting the Temple as a "House of Prayer for All Nations" and who uphold the right of Jews AND Christians to ascend the Temple Mount. "And it will come to pass that everyone left of the nations who came up against Jerusalem will go up from year to year to prostrate himself to the King, the Lord of Hosts, and to celebrate the festival of Tabernacles." Now, have any of those things happened yet? I think we would have noticed. These are prophecies that people can't "fulfill," so the Christians just ignore them. This aptitude is what allows them to also continue to believe that their false god was the messiah even though none of the messianic prophecies were fulfilled in his lifetime. In fact, just the reverse. However, there is no excuse for us not to know this. I will end here with a plea that all of you reading this will take my words to heart and start now to keep your distance from the nations. Please do not attend their parade in Jerusalem over Sukkot and please, please try to influence as many good Jews as you can during these days to follow your good example. I'll leave you now with a demonstration of all that is wrong with us right now (see video below) and pray that we can still do proper teshuvah in the time left until Hoshanah Rabbah when the decree sealed on Yom Kippur is issued. Until then it can still be torn up and changed. Wishing for all Klal Yisrael the happiest, most joy-filled Sukkot ever with the expulsion of all evil and all tumah from our midst and the revelation of The Redeemer in our days. May it be the will of HKB"H to fulfill it. Fulfilling Prophecy or Fulfilling Mitzvot? Jacob is the measure of His inheritance. He preserved him like the pupil of His eye. taking them, carrying them on its pinions. and no other power was with them. I realize that what follows is long, but I can't over-emphasize how important it is for you to know and understand this history. What army goes to war without first studying the enemy's tactics and battle strategy? This information is crucial to understanding where we stand today. It is critical to understanding who is friend and who is foe and it is essential to correctly choosing the path that will lead to survival at the End of Days. Evangelical Christians are fixated on "prophecy." That's because their entire false religion is built on a foundation of misrepresented, mistranslated, and misinterpreted Hebrew prophets. Once they are finished with learning the prophecies they claim predicted JC's first coming, they are on to learning the ones they claim predict his second coming. The goal of the first is to prove his claims to those they wish to proselytize and the second is in order to bring about his second coming. Jews tend to wave it all off as an exercise in futility, knowing all the while that JC is not coming back. But, that is a mistake because Jews and Israel are at the core of their efforts on both counts with dire consequences for us. It is recorded in the Christian Testament that JC undertook certain actions in order "to fulfill what the Lord had said through the prophet"..."And so was fulfilled what the Lord had said through the prophet"..."So was fulfilled what was said through the prophets..." There are no less than 157 occurrences of the word "prophet" in the Christian Testament and they occur in every single book. This is a religion obsessed with prophecy. Unlike Judaism, Christianity holds the prophetic writings as equal in authority to the Five Books of Moses. A Jewish Judge adjudicates according to Torah and Halachah, but never by the recorded prophecies. That was never their intent, nor their place. Like in times past, the Christian Zionists of today are busy trying to fulfill prophecy and are eager and anxious to involve Jews in it, too. But, if the Jew is smart and sincere in his desire to serve HKB"H, he will distance himself from that and concentrate on his real job - the fulfillment of mitzvot!! For most of Christian history, if the Church said it, people believed it (or not). But, something earth-shattering and history-changing happened during the Reformation when the Christian Bible was released into the hands of the common people. Until then, no one but the priests were allowed to learn it and even when it was read publicly, if it was, it was in Church Latin, a language few, if any, of the congregants would understand. This opened the door to the division of Christianity into thousands of sects, denominations and movements over time that would result from the individual interpretation of "Holy Scripture." ...John Owen, a 17th-century English Covenant theologian, for example, wrote: "Moreover, it is granted that there shall be a time and season, during the continuance of the kingdom of the Messiah in this world, wherein the generality of the nation of the Jews, all the world over, shall be called and effectually brought unto the knowledge of the Messiah, our Lord Jesus Christ; with which mercy they shall also receive deliverance from their captivity, restoration unto their own land, with a blessed, flourishing, and happy condition therein." John Gill took a similar position. Ironic that they envision "falling upon each other's necks" with a kiss as this was the event that marked the final meeting between Ya'aqov and Eisav until they meet back up at the End of Days. What is even more ironic is that the Arizal says that JC was actually the reincarnation of Eisav! "...that the Lord J*sus will come in person to introduce the millennial age, when Israel shall be restored to their own land, and the earth shall be full of the knowledge of the Lord; and that this personal and premillennial advent is the blessed hope set before us in the Gospel for which we should be constantly looking." ...The dispensationalist theology of John Nelson Darby which motivates one stream of American Christian Zionism is often claimed to be a significant awakener of American Christian Zionism. He first distinguished the hopes of the Jews and that of the church and gentiles in a series of 11 evening lectures in Geneva in 1840. His lectures were immediately published in French (L'Attente Actuelle de l'Eglise), English (1841), German and Dutch (1847) and so his teachings began their global journey. We look forward, then, for these two things. I am not going to theorize upon which of them will come first — whether they shall be restored first, and converted afterwards — or converted first and then restored. They are to be restored and they are to be converted, too. All Christian Zionists today hold by this. (If they didn't, they Most are of the opinion that the conversion will come afterwards and that their mission today is to build relationships, break down the walls and barriers that divide us so as to pave the way for that mass conversion, i.e. soften Jewish hearts toward Christianity and thereby, its founder so they will be more receptive when the time comes. The following is so expressive of current sentiment, it could be posted to BIN! The FOZ Museum promotes the narrative that were it not for Christian Zionist Friends of Israel, there might not even be an Israel. Like President Trump, he is looking for the proper expression of gratitude, but we'll examine later whether we have Christian Zionists to thank or not. Because of his connections, Hechler was able to arrange for Herzl an audience with the German Kaiser, who became very supportive, and who had significant influence with Turkey, then rulers of Palestine. However, the Turkish Sultan would not hear of an independent Jewish state in the Holy Land. Nonetheless, the friendship and partnership between Herzl and Hechler continued to grow. Hechler was even with Herzl to the end, where the Jewish leader bid Hechler to “Greet Palestine for me. I gave my life’s blood for my people”. Herzl called Hechler a “Christian Zionist”, due to his great love for Jewish people, and determination to see Israel restored once again. Hechler was not only concerned with the prophetic and political ramifications relating to Israel, but was eager to align with God’s heart and plans for the people themselves, that they would be protected from danger and evil, and restored to the land as God ordained in his word. However, even after their dreams were becoming reality with the Balfour Declaration of 1917 promising to create a Jewish homeland in Palestine under the British Mandate, Hechler was frustrated that many Jewish people were not eager to move there. ...A new understanding of Bible truth and the support of evangelical Christians provided the foundation of the Balfour Declaration. Having just celebrated the 500th Anniversary of the Reformation we know it was Martin Luther who made the Bible available to the common man. As everyday believers began to read the scriptures in the 16th Century they saw God’s promises to His ancient people and were envisioned to support the return of the Jews to their promised land. This became a major prayer focus over the next few centuries as more and more Christians rallied to see an end to the diaspora. Furthermore, preachers like Charles Spurgeon taught on the restoration of Israel. This resulted in the increased influence of Bible-believing Christians in the government, who supported the formation of a Jewish homeland. ...Balfour 100 is a UK Christian coalition established to commemorate the Balfour Declaration. They hosted a Centenary event at the Royal Albert Hall in London on November 7 bringing Jews and Christians together. Entitled "Partners In This Great Enterprise," it showed how God used both Christians and Jews to bring about the return of the Jewish people from exile. “The Balfour Declaration became the title deed for the founding of Modern Israel,” said the organisers. “God’s Hand was in every step of this partnership between Jews and Gentiles. This essay highlights U.S. pentecostals' and charismatics' cultivation of more experiential forms of identification with Jews and with Israel that in turn played a crucial role in the global growth of Christian Zionism. Already at the turn of the twentieth century, key figures experimented with “Judeo-centric” forms of ritual and dress, merging eschatological concerns inherited from nineteenth-century Protestantism with British Israelite ideas equating Anglo-Saxons with the lost tribes of Israel. In subsequent decades these racial notions were pushed to the fringes of the pentecostal movement, but the intense sense of identification with Israel remained. Building on the emergent mythology in the mid-century U.S. of a shared “Judeo-Christian tradition,” adherents increasingly stressed their religious and cultural (as opposed to racial) connections with God's “chosen people.” And by the late twentieth century, the 1960s counterculture, a burgeoning emphasis on the therapeutic, and growing religious diversity all facilitated pentecostals' and charismatics' renewed experimentation with “exotic” Israel-themed rituals. Significantly, believers' appropriation of Jewish-based religious practices and identities transcended nationalistic categories, and reinforced post-American sensibilities in important respects. As such, U.S.-based evangelists and broadcast ministries were able to disseminate pentecostalized expressions of Christian Zionism well beyond North America, and help catalyze a transnational, global movement. 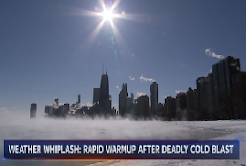 "Surviving the End of Days"
I'm trying to rush this information out because I get the feeling we are near the end of this process and all stops are going to be pulled out in the very near future by the Other Side. I want us to be ready for what is yet to come. As Rabbi Richter says, "You can't let the bad guys win!" Meantime, I'd like to leave you with an important word from the Chafetz Chaim. The first part of the quote should be very familiar, but the second part is far less well known and that is the part I'd like everyone to focus on today and think about until next week. After that, if you can find the time to read over Devorah Fastag's e-book "Whatever Happened to the Aschalta Degeula," it might be good preparation for what I hope to discuss next. "During the First World War many came to the Chafetz Chaim and asked him if this is the ‘End of Days’ and the war of Gog and Magog. The Chaftez Chaim answered: ‘After this war there will be a pause and then there will be another war and then another pause. Then, there will be another war and with that war the Mashiach will come…the last war will be the beginning of the redemption, and a Torah-true Jew who is completely separated from the non-Jews will not be subjugated, as we find that in Egypt when two people drank from the same cup, one (an Egyptian) drank blood and the other (an Israelite) drank water. This shows that in fact there is no rule whatsoever over a Jew who is separated entirely from the non-Jews” (Rabbi Aharon Kotler, in the name of the Chafetz Chaim, Leket Reshimot Channukah by Rabbi Noson Wachtofogel, p. 40). God willing and with His help and blessing, we will talk much more about this in the near future as it is the key to the final test of our time. The Three Wars of Gog uMagog and "The Holy Trinity"
Sneak Peek: We are already in the Third War of Gog uMagog. Now read on. 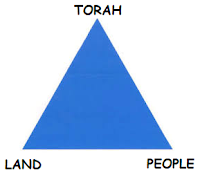 Rabbi Nachman Kahane refers to it as "the only authentic holy trinity": Eretz Yisrael, Am Yisrael and Torat Yisrael. "These three components are repeatedly emphasized as the sides of the triangle representing God's interest in this world." From the Jewish perspective, what was the most significant outcome of WW1? 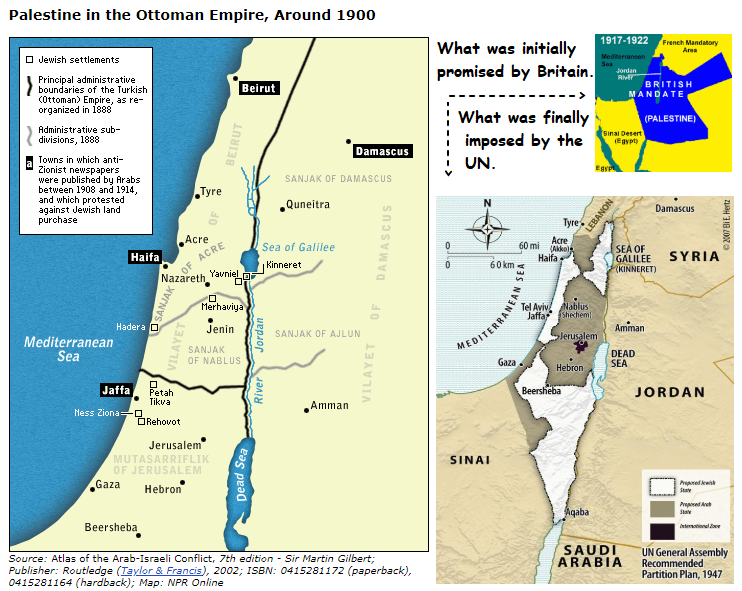 It had to be the transfer of power over Eretz Yisrael from Yishmael (Ottoman Empire) to Eisav (British Empire). This has been viewed as a very positive outcome, but was it really? Either way, this war was meant to thwart the Jewish return to Eretz Yisrael. Also, significantly, the exile of Bavel was primarily about removing us from Eretz Yisrael. No one can deny that the focus of WW2 was on Am Yisrael as one-third of the world's Jewish population was extinguished in Europe. The parallel with Haman's decree of annihilation also cannot be overlooked. Now, we arrive at today and we can see clearly that there is a very severe war being waged on the Torah of Israel. That's how we can know without a doubt that we are already in the third war of Gog uMagog; although the military aspects of these wars must also be acknowledged. Translated the Torah into Greek. Forbid the Jews on pain of death to observe Rosh Chodesh, Shabbat, and brit milah. as well as the learning of Torah. Promoted Hellenistic Judaism - a hybrid religion combing traditional aspects of Judaism with Greek thought and culture. This WW3 War on the Torah is being carried out with the same goal today, but in reverse measures. The New Testament is handed out in Hebrew and Yiddish translation. Christians in their masses are learning Torah and 'observing' mitzvot, including Shabbat, etc. Judeo-Christianity is the new hybrid religion "breaking down the walls" and "building bridges" between Jews and Christians so as to create "One New Man from the two." Annihilation through assimilation - a "soft" weapon of mass destruction (WMD), but just as effective. Whose Torah - God's or Ours? [Hashem:]....Assemble the people: the men, the women, and the children, and your stranger in your cities, in order that they hear, and in order that they learn and fear the Lord, your God, and they will observe to do all the words of this Torah. ...When I bring them to the land...they will turn to other deities and serve them, provoking Me and violating My covenant. And it will be, when they will encounter many evils and troubles, this song will bear witness against them, for it will not be forgotten from the mouth of their offspring. For I know their inclination what they [are planning] to do today, [even] before I bring them in to the land which I have sworn [to give them]." [Moshe Rabeinu:]..."Take this Torah scroll and place it along side the ark of covenant of the Lord, your God, and it will be there as a witness. For I know your rebellious spirit and your stubbornness. Even while I am alive with you today you are rebelling against the Lord, and surely after my death! ...For I know that after my death, you will surely become corrupted, and deviate from the way which I had commanded you. Consequently, the evil will befall you at the end of days, because you did evil in the eyes of the Lord, to provoke Him to anger through the work of your hands. "Through the work of your hands" - worshiping a god of your own making or observing a 'Torah' of your own creation. In other words - avodah zarah. The English word "idolatry" does not adequately convey the all-encompassing nature of the Hebrew avodah zarah. A more accurate translation is strange or foreign worship or service. By this we can understand one reason given for why the sons of Aharon HaCohen, Nadav and Avihu, were at fault when they brought eish zarah [strange or foreign fire] to the altar and died. HKB"H was very exacting in the commandments He gave to Moshe Rabeinu and Aharon HaCohen about how He is to be served and worshiped. And we were very strictly warned against deviating from it either to the left or to the right! We are not allowed to 'improve' upon it with our own ideas and imagination. But, even so, HKB"H already knew some of us were bound to do it. Moshe Rabeinu said they have "rebellious spirits" meaning they are not simply misled and they are not open to correction. Generally speaking, they know better than HKB"H, God forbid. “With time, false prophets arose who claimed that G-d had commanded the people to worship specific stars or forces” (Rambam, Hilchos Avodah Zarah 1:2). The Rambam explains that this developed into extensive cults. “The primary commandment of Avodah Zarah is to not worship anything that was created, not an angel, not an extraterrestrial force and not a star… even when the worshipper knows that Hashem is the only G-d” (Rambam, Hilchos Avodah Zarah 2:1). We see that worshipping or performing any act of reverence to a force other than Hashem is included in Avodah Zarah, even when one accepts that all decisions are made by Him. Creating a new religion, 'improving' or "adding" and "subtracting" from the Torah-and-halachah established order is strictly forbidden. It constitutes avodah zarah. ...you will surely become corrupted, and deviate from the way which I had commanded you. Consequently, the evil will befall you at the end of days, because you did evil in the eyes of the Lord, to provoke Him to anger through the work of your hands. "The evil will befall you at the End of Days"
In coming blog posts, God willing and with His help, we are going to see how the hybrid man-made religion "Judeo-Christianity" (Hellenism in reverse) has arisen as this "evil" at the End of Days. From all that I know, from all that I have learned and from all that I have experienced, I have come to these two conclusions which I believe are reliable, as they comport 100% with our Torah and Mesorah. And I believe further that if we can just keep these two things uppermost in our minds - the final war and the final test - and judge everything we are encountering by how it fits into this picture, we can easily determine the right and the wrong of it. The Final War: A war for hearts and minds, fought on an emotional as well as a philosophic level - it succeeds where confusion, doubt, fear, pride and ignorance hold sway. Therefore, it fails in the presence of confidence, trust and faith in HKB"H, humility of spirit and a firm foundation of Torah knowledge. What does the Torah really say and what does it really require of us? Do we have the freedom to reinterpret it in accordance with our own inner spiritual sensitivities, our own "moral compass?" The Final Test: The task is to OBEY the commandments! The temptation is to make our own calculations and follow our own reasoning which leads to deviation from the commandments. Twice before in human history, we've faced this test and failed. Only by confronting the same test and succeeding, where in the past we failed, can a rectification be made. Scenario #1 - Gan Eden - The Loyalty Test: Follow Hashem's command or listen to the voice of the serpent planting doubts about God's motives and urging us to make up our own mind. Scenario #2 - Har Sinai, the Midbar - The Loyalty Test: Follow Moshe's instructions to wait until he comes back down the mountain or listen to the voice of the Erev Rav planting doubts whether he will really return and urging us to make a golden calf as his replacement. Scenario #3 - Eretz Yisrael among the Global Human Community - The Loyalty Test: Follow the Torah's demands to remain separate from the nations or listen to the combined voices from within and without telling us that the path to redemption is to be found in unity with the nations of the world. The Doubt-and-Confusion Tactic for this scenario: We need not wait to be redeemed. We can redeem ourselves. And we will do it in partnership with the nations of the world. That's it in a nutshell, but there is much more to be said. Hopefully, it will become clearer in the coming days. Think about this. What are two of the hardest things for human beings to do? 1. Give up control. 2. Admit dependency. This was the stage we finally reached when we cried out to Hashem at Yam Suf and that is the place we have to find again before we will be redeemed at the End of Days. And the reason is, it is a place where the Ego is completely nullified! When people erroneously forbid information from being disseminated on account of thinking that it is Lashon Horah – terrible tragedies result. When people think that it is absolutely forbidden to pass on necessary information, people cannot take protective measures. At times this too can be quite devastating. Setting Trump Up for the Pence Takeover? "Coming Together as One Despite Our Differences"
"Given Over to Strong Delusion"